Having missed out on the earlier furore and excitement over speculation that Star Wars battleship designs might have been inspired by the work of a late medieval Italian draughtsman, we appreciated how Super Punch brought us up to speed. 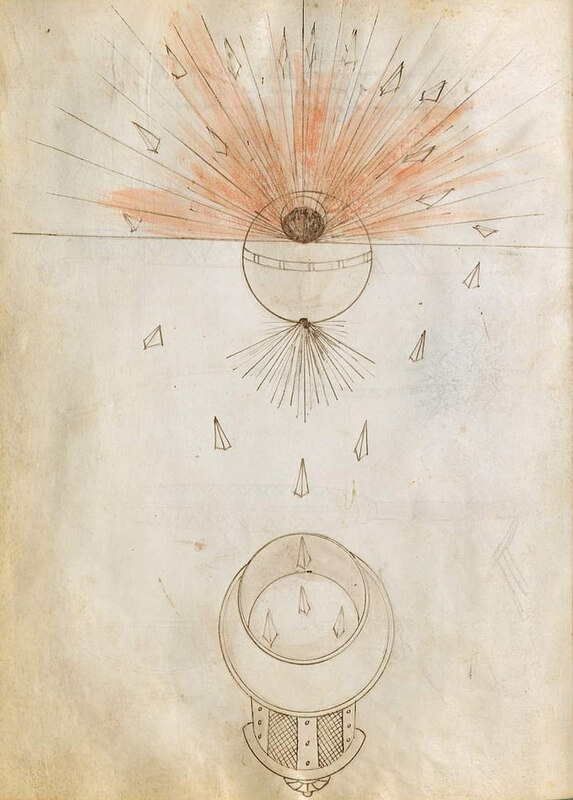 While the pareidolia of seeing a fully-operational Death Star escorted by an array of Star Destroyers (plus earlier conceptions of the Imperial and Rebel fleets) is lure enough on its own, the imagination and career of the fifteenth-century Venetian surgeon and engineer, Giovanni Fontana (Johannes de Fontana), is pretty engrossing as well. Though only illustrations have survived the ages, Fontana invented and built functioning prototypes of what we’d recognise as the bicycle, the magic lantern, the torpedo plus many innovations in hydraulics and trigonometry and cryptography. Fontana’s overarching goal was to recreate those machines and devices of great antiquity, the stuff of legend, and some see a similarity between his style of illustration and the baffling pictures and text of the mysterious Voynich manuscript.